M.A. 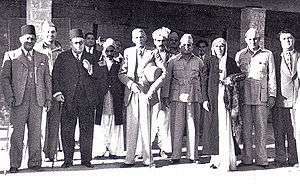 Jinnah (middle) and Fatima Jinnah (3rd right), stands with the Muslim philosophers at the convention who presented the Idea of Pakistan, circa before 1947. The Pakistani philosophy is the philosophical activity or the philosophical academic output both within Pakistan and abroad. It encompasses the history of philosophy in the state of Pakistan, and its relations with nature, science, logic, culture, religion, and politics since its establishment on August 1947. Academically, the philosophical activities began in the universities and the thought organization founded by renowned philosopher Dr. M.M. Sharif in 1954. In an editorial written by critic Bina Shah in Express Tribune in 2012, "the philosophical activities in Pakistan can nevertheless both reflects and shapes the collected Pakistani identity over the history of the nation." When Pakistan gained independence there was only one department of philosophy in the country, at Government College Lahore. Now there are seven departments of philosophy at different Pakistani universities, and many Pakistani philosophers are doing research in diverse fields of philosophy. Notable Pakastani philosophical organizations include The Pakistan Philosophical Congress, which was founded by M. M. Sharif, a pupil of G. E. Moore, in 1954, and the Islamic Philosophical Association. In addition there are various smaller groups devoted to promoting philosophical study and research. While philosophy in Pakistan has been greatly influenced by Western philosophy, it nonetheless retains strong elements of the tradition of Muslim philosophy. The Pakistani philosophy community includes adherents of all the major strands of contemporary western philosophy, including a significant number of Pakistani philosophers who are inclined towards more traditional, metaphysical, positions. Pakistani philosophers include: Allama Muhammad Iqbal, Irfan Muhammad (KU), M M Sharif, Khalifa Abdul Hakeem, C A Qadir, Kazi A Kadir, Abdul Wahab Suri (KU), Ather Rasheed, Absar Ahmad, Intasar ul Haq, Waheed Ali Farooqi, B H Sidiquei, Sajid Ali, Abdul Khaliq, Naeem Ahmed, Abdul Hafeez, Muhammad Maroof, Mirza Ather Beig, Shahid Hossain, Fazlur Rehman, Shehzad Qaiser, Manzoor Ahmed, Ghazala Irfan, Javed Bhuto, Syed Zafarul Hasan, Robina Lodhi and Waqar Aslam. 1 2 et. al., Richard V. DeSemet SeJ. "Philosophical Activities in Pakistan:1947-1961". Work published by Pakistan Philosophical Congress. Work published by Pakistan Philosophical Congress. Retrieved 25 November 2013. ↑ Kazmi, A. Akhtar. "Quantification and Opicity". CVRP. Retrieved 25 November 2013. ↑ Ahmad, ed. by Naeem (1998). Philosophy in Pakistan. Washington, DC: Council for Research in Values and Philosophy. ISBN 1-56518-108-5. ↑ Shah, Bina (November 21, 2012). "Philosophy of Pakistan". Express Tribune, 2012. Retrieved 25 November 2013. DeSemet, Richard. Philosophical activity in Pakistan. Pakistan Philosophical Congress. p. 132. LloZAAAAMAAJ. Javed, Kazi. Philosophical Domain of Pakistan (Pakistan Main Phalsapiana Rojhanat) (in Urdu). Karachi: Karachi University Press. Nasr, ed. by Seyyed Hossein Nasr (2002). History of Islamic philosophy (Repr. ed.). London [u.a. ]: Routledge. ISBN 0415131596. Ahmad, ed. by Naeem (1998). Philosophy in Pakistan. Washington, DC: Council for Research in Values and Philosophy. ISBN 1-56518-108-5. Stepaniants, Mariėtta Tigranovna. Pakistan: Philosophy and Sociology:. Karachi, Sindh: People's Publishing House. XfUSAAAAMAAJ. Ishrat, Waheed (2007). Understanding Iqbal's philosophy. Lahore: Sang-e-Meel Publications. ISBN 9693520734.